This article explains the 4MAT Learning Cycle Model in a practical way. After reading this article, you’ll understand the basics of this powerful effectiveness tool. What is the 4MAT Learning Cycle Model? The 4MAT Learning Cycle Model is a framework for creating a dynamic and more involved style of teaching by accurately visualising the learning process that each learner goes through. 4MAT provides a common framework for understanding the way in which individuals and groups go through the process of interpreting, assimilating, acting on and integrating knowledge. The 4MAT Learning Cycle Model is based on the four different styles of learning developed by David Kolb. Each of the categories from the final model is based on a question that reflects what the learner is looking for in new knowledge. In addition to being used in the classroom, the model is also suitable for use in the organisational field, for example, for presentations. It helps teachers to make their lessons more interesting because doing so encourages and stimulates a higher level of student involvement and understanding. 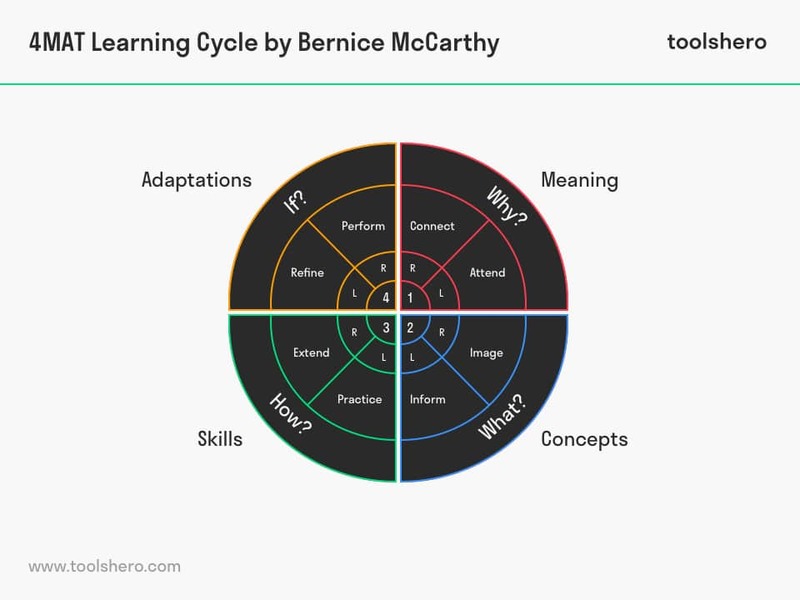 Bernice McCarthy developed and published the 4MAT Learning Cycle Model in 1980, but she came up with the idea when she worked as a kindergarten teacher in the 1970s. She researched how children learned and created her theory by combining existing theories and her practical knowledge. The theories that she used for this were Kolb’s model of learning styles and the concept of the two brain halves that process information in a different way. In short, there are four learning styles outlined in the 4MAT model in relation to the dynamics that arise through interactions between the observation mode and information processing mode. The result is an 8-step sequential instruction model that is made up of four quadrants. The 4MAT Learning Cycle Model explains how people learn in terms of observing and processing information. The way people record new information happens in an infinite variety of ways, but between them all there is a relationship between experience and conceptualisation. Experience is the perception of personally involved sensations, emotions and physical memories: to be in the moment. Conceptualisation is the translation of experiences into conceptual forms: ideas, language and hierarchies. The interplay between the feeling of experience and conceptualisation is crucial for the learning process. It connects the personal values and perceptions of the learner with those of the experts. Processing is about what the learner does with the new information. This also happens in a variety of ways, but they are all related to reflection and action. Reflection is the transformation of knowledge through structuring and ordering. Actions are about applying the ideas to the external world, testing, executing and manipulating them. This interaction between reflection and action is important because it encourages action on internal ideas. It encourages the learner to test their ideas in the real world and to adapt their learning process to multiple situations. The 4MAT Learning Cycle Model has four phases in a learning cycle, attached to a separate style of learning. The styles of learning will be explained later in this article. Every learning style is determined by the way the left and right halves of the brain function, which means that every quadrant has a left and right mode. The left half prefers structure and order, language and numbers and works to analyse information. The right half includes visualisation, images, searches for patterns and creates metaphors. A high dynamic between the left and the right half is crucial for higher learning and thinking, and stimulates creative thinking processes and problem-solving abilities. In the first quadrant, the reason why something should be learned is created, the answer to the question ‘why?’. This makes use of the ‘right mode’ of the brain. The goal is to have the learner experience it for themselves by getting them involved. This can be done, for example, by having the learner share his or her own experiences. This way the experience is stimulated by personal meaning. The teacher or expert who wants to convey something to others has a motivating role here and only has to guide the discussion. In the left-hand mode of quadrant 1, the students examine the experience. The method once again involves a discussion, but this time students are asked to look past their own experience. The experience then flows into a meaningful dialogue and reflection. The goals of the first quadrant are: giving meaning to the subject, visualising and allowing the student to integrate aspects of the subject. The question of ‘what?’ needs to be answered in the second quadrant. In this step, an attempt is made to make the student reflect more deeply. It is an integrating step in the right mode of the brain. Teachers should move the students from the concrete to the abstract. The subjective experiences will be mixed with the abstract theory that will be handled at a later stage. This allows pupils to form a picture of the subject material, which makes them reinforce their focus. In the left-hand mode of quadrant two, the teacher takes the student to the core of the conceptual information. This is all about taking in information. The information that you choose to share should be based on the concept and shared experiences, and should lead to further research by the student. The goals in quadrant two are conceptualising, defining, shaping and acquiring knowledge. In the third quadrant the ‘how’ question is answered. In this step, students actively get started with the knowledge gained from the previous steps from the left mode. They will use worksheets, run experiments or use related technology. In the right mode of the third quadrant, the students will make their own contribution to the teaching material. This may be a personal synthesis, but they should above all be offered the opportunity to approach the content of the lesson in their own way. This is a right mode activity. The common sense students, described in the heading ‘the learning styles in the 4MAT model’, feel most at ease here. The teacher can let students create a project proposal related to the curriculum, which encourages them to think actively. The objectives from quadrant three include collecting data, asking questions, hypothesising, tinkering, experimenting and making decisions. In the fourth quadrant, the ‘what if’ question will be answered. In this step, the students are asked to analyse what they’ve planned as an addition to what they’ve learned from the previous step. The analytical aspect to this step makes it an activity for the left mode. This seventh step requires students to refine what they’ve learned and applied in the exercises. In the final step of the 4MAT model’s learning process, the students explain to each other what they have learned or created. It’s also important in this step that the students are asked to talk about what they’ve learned and gained from this entire cycle. The goals in the fourth quadrant are, among others: identify limitations, review, close, summarise and evaluate. The imaginative type likes to engage in feelings and spend time on reflection. This type of learner desires personal meaning and involvement. Type 1 is focused on personal values for themselves and others and makes connections quickly. 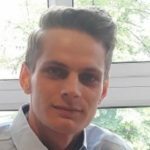 This type’s favourite question is: why should I learn this? The analytical type of learner likes to listen, to think about information and to come up with ideas. This type is interested in acquiring facts and delving into concepts and processes. They can learn effectively and enjoy doing independent research. The type 2 learner’s favourite question is: what should I learn? The common sense type likes thinking and doing. Type 3 is satisfied when they can carry out experiments, build and design and create usability. This type likes tinkering and applying useful ideas. This type’s favourite question is: how should I learn? The dynamic type of learner loves doing and feeling. This type is continually looking for hidden possibilities and researching ideas to make original adjustments. They learn through trial and error and self-discovery. Type 4’s favourite question is: what if I learn this? What do you think? Are you familiar with the explanation of the 4MAT model? Do you recognise the various phases during the observation and processing of new information? How do you think learning can be stimulated by applying this model? Do you have any tips or additional comments? Scott, H. V. (1994). A Serious Look at the 4MAT Model..
Wilkerson, R. M., & White, K. P. (1988). Effects of the 4MAT system of instruction on students’ achievement, retention, and attitudes. The Elementary School Journal, 88(4), 357-368.